Cecil Harry Wood was born in Yeovil in 1885, the son of printer's compositor Alfred H Wood (b1857) and his wife Elizabeth (b1855). In ten years Alfred and Elizabeth were to have five sons, all born in different towns or villages; William (b1882, Ashbrittle, Som), Cecil, Percy (b1887, Axbridge, Som), Tom (b1889, Sherborne, Dorset) and Arthur (b1892, Poole, Dorset). By the time of the 1891 census the family were settled in Sherborne where they stayed until 1901. By this time 15-year old Cecil had taken up his father's trade and was a printer's compositor. In the winter of 1910 Cecil married Rose Florence Travers (b1887) at Weymouth. They set up home at 9 Spring Gardens, Portland, Dorset, where they were listed in the 1911 census a couple of months later. Cecil gave his occupation as a printer's jobbing compositor. At some time in the next couple of years Cecil and Rose moved to New Bilton, Warwickshire, and Cecil enlisted in the 2nd Battalion, Royal Warwickshire Regiment at Rugby, Warwickshire. His Service Number was 10466, suggesting he enlisted towards the end of 1915. In early 1916 the 2nd Warwicks were involved in The Battle of Albert. Fought from 1 to 13 July 1916, it is the official name for the British efforts during the first two weeks fighting of the First Battle of the Somme. As such it includes the first day of the Somme, the most costly day in British military history and one that has coloured our image of the First World War ever since. The Battle of the Somme had been intended to be a big Anglo-French assault on the centre of the German lines but, by the time the battle began, it turned into a largely British affair, with support from the French Sixth Army on the Somme itself. The artillery bombardment began seven days before the infantry were due to go in. It was not as effective as had been hoped, leaving large portions of the German front line intact. The German lines on the Somme contained a large number of deep concrete bunkers, which protected the Germans from the British bombardment, allowing them to emerge once the bombardment ended. Worse, along most of the British front the bombardment failed to destroy the German wire. Following this, Cecil fought in The Battle of Bazentin Ridge (14–17 July 1916) which was also part of the Battle of the Somme. The British Fourth Army made a dawn attack on 14 July, against the German 2nd Army in the Braune Stellung from Delville Wood westwards to Bazentin le Petit Wood. Dismissed beforehand by a French commander as "an attack organized for amateurs by amateurs", the attack succeeded. The Battle of Delville Wood, fought between 14 July and 3 September, was an engagement in the 1916 Battle of the Somme in which the 2nd Battalion, Royal Warwickshire Regiment, was deeply involved. Delville Wood is to the north east of the town of Longueval in the département of the Somme in northern France. After the two weeks of carnage from the commencement of the Somme Offensive, it became clear that a breakthrough of either the Allied or German line was most unlikely and the offensive had evolved to the capture of small prominent towns, woods or features which offered either side tactical advantages from which to direct artillery fire or to launch further attacks. Delville Wood was one such feature, making it important to German and Allied forces. As part of a large offensive starting on 14 July, it was intended to secure the British right flank, while the centre advanced to capture the higher lying areas of High Wood in the centre of his line. Delville Wood was a battle to secure this right flank. The battle achieved this objective and is considered a tactical Allied victory. However, it was one of the bloodiest confrontations of the Somme, with both sides incurring large casualties. The fighting continued immediately with the Battle of Guillemont (3–6 September 1916) which was an attack by the Fourth Army on the village of Guillemont. The village was on the right flank of the British sector, near the boundary with the French Sixth Army. The Fourth Army had advanced close to Guillemont and the capture of the village was the culmination of British attacks. The attacks were intended to advance the right flank of the Fourth Army and eliminate a salient further north at Delville Wood. Cecil's battalion was next fighting a series of actions known as the Operations on the Ancre that lasted from 10 January to 22 February 1917. Military operations by both sides concentrated on surviving the rain, snow, fog, mud fields, waterlogged trenches and shell-holes. British operations on the Ancre forced the Germans back five miles (8.0 km) on a four mile (6.4 km) front, and eventually took 5,284 prisoners. On 22/23 February, the Germans fell back another three miles (4.8 km) on a fifteen mile (24 km) front. Cecil's final action was the Second Battle of Arras. This was fought between 9 April and 16 May 1917 and was the British contribution to the Allied spring offensive of 1917. The original Allied plan for 1917, agreed at the Chantilly conference of November 1916, was for a second offensive on the Somme, but that plan was abandoned after a change of French leadership and it was decided that the British would attack around Arras and involve troops from three armies. In the north the Canadian corps of the First Army would attack Vimy Ridge. In the centre of the line the Third Army under General Allenby would attack from Arras. Finally, the British Fifth Army under General Gough would attack on the right of the line. The entire British attack was supported by 2,879 guns each of which had close to 1,000 shells. The British attack made impressive progress, but it did not achieve a breakthrough on the first day, allowing the Germans to rush their reinforcements into the gap and launch a series of counterattacks thereby slowing down the British attack. A renewed British attack at Bullecourt on 11 April failed to make any progress and the attack was suspended. The month of fighting around Arras cost the British 84,000 casualties and the Germans 75,000. Tactically it was a clear British victory, but the overall plan to cut off the German salient had failed. 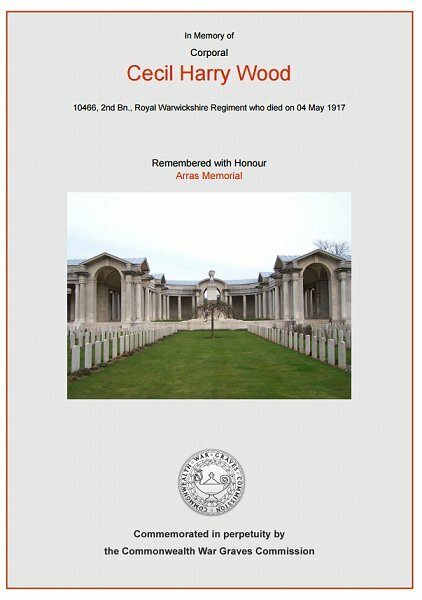 Acting Corporal Cecil Wood was killed in action at Arras on 4 May 1917. He was aged 32. His name is inscribed on the Arras Memorial, Bay 3. His name was added to the War Memorial in the Borough in 2018. The Commonwealth War Graves Commission certificate in memory of Cecil Wood.